In the evening her stepmother returned and was much amazed to find Helena sitting quietly with her work all finished before her. She praised her diligence, but at the same time racked her brain as to what harder task she could set her to do. The next day she told Helena to empty a pond near the house with a spoon which was full of holes. Helena set to work at once, but she very soon found that what her stepmother had told her to do was an impossibility. 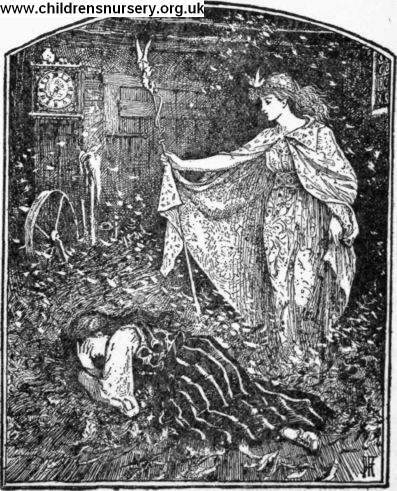 Full of despair and misery, she was in the act of throwing the spoon away, when suddenly the kind fairy stood before her again and asked her why she was so unhappy.